A potentiometer is a resistor that has a mechanical shaft or screw that can be turned to change its resistance. Potentiometers are also called "pots" for short. e.g. The circuit requires a 10k pot. Potentiometers can be panel mount type as the left two are shown in the above photo. They can also be preset type that have an adjustable screw. 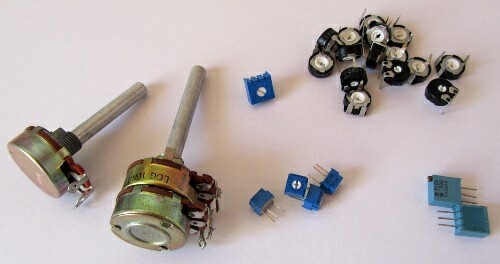 Various preset potentiometers are shown in the right of the photo. Preset potentiometers are also known as trimmers or trimpots. A screwdriver is needed to adjust a trimpot. The resistance of the potentiometer can be linear or logarithmic. Logarithmic pots (log pots) are used in audio applications. Linear pots are used for everything else. The second pot from the left in the photo shows a ganged log pot that is intended for use in stereo audio equipment. It has two log pots that are controlled by one shaft. Slide pots are also available instead of the rotary pots shown here. They can be used in applications such as audio equalisers. Potentiometers come in various resistance values, e.g. 10 ohm, 100 ohm, 470 ohm, 10k ohm, 22k ohm, etc. 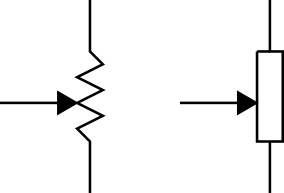 The outer two pins of the three pins of the potentiometer are the same as the pins of a resistor. The rated resistance of the potentiometer can always be measured between the outer two pins – e.g. a 10k pot will always have a value of 10k ohms between the two outer pins. The centre pin or "wiper" moves along the resistive material between the two outer pins. The resistance between an outer pin and the wiper will change as the shaft of the potentiometer is rotated.